On the hunt for the most interesting home decor? 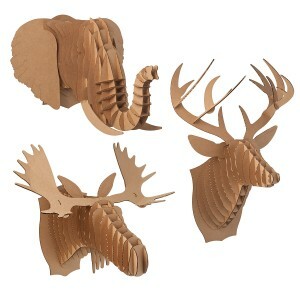 More modern design than hunting lodge, these clever, cruelty-free cardboard deer and moose heads are a fun way to add a trophy to your wall without having to go after Bambi’s mom. Easy to assemble, the kit includes numbered cardboard sheets and detailed instructions. Designed by Luis Rodrigalvarez of Cardboard Design. Made of 100% recycled cardboard in Virginia.